Along the wall of Frisco Tap House in Columbia, Maryland, a rainbow menagerie of wood, polyurethane and metal pop against a backdrop of polished aluminum. Everything from canoes to dragons to baseball bats form a grand display, presenting their colors and plumage in hopes of winning a mate, at least for a pint. These are, of course, tap handles, and each is placed at about the drinker’s eye level carefully and deliberately. The bar boasts 50-plus draft lines, each with its own unique handle crowing the spout. Despite brewery swag dotting the walls and a modern LCD board displaying the tap list, the handles take center stage, shining brightly under the spotlight of back-bar glory. The stairs up to the manager’s office are lined on each side by tap handles of old, like a mini-museum of the bar’s (and the beer’s) history. From the stool side of the bar, a handle tells a story. The Holy Grail-topped handle for The Brewer’s Art Resurrection reminds me when I finally turned the corner on liking Dubbel, while Southern Tier Brewing Co.’s blocky font and grinning jack-o’-lantern flashes me back to my first affair with pumpkin spice. Each represents a microcosm of a bigger beer narrative, a single totem tying together all your previous experience with a beer, a brewery, a time, a place. Customers may see them as simple pieces of bar décor, but breweries see them as an important opportunity to sell you a beer. Like some beer styles, the American tap handle has British ancestry. Pump clips, the removable branding equivalent of tap handles, were one of the first incarnations of tap-centric marketing, but started as little more than labels for bartenders. “When breweries controlled all or most of the pubs in a given area, and pubs sold only their own beer, there wasn’t much need to advertise,” says Ray Bailey, co-author of Brew Britannia: The Strange Rebirth of British Beer. But after the Supply of Beer Orders in 1989 (which mandated pubs carry a “guest” ale), a drinker’s options increased dramatically. “By the mid-’90s, pump-clips started to become more showy,” says Bailey. Competition fueled the need for more elaborate on-premise designs. But outside the occasional beer engine, Americans don’t use pump clips. While a large handle was needed for English bartenders to manually pull beer up from casks in the cellar, C02 moves the beer in modern kegs. The handle remains not out of necessity but out of tradition, a functional tool turned artistic display. 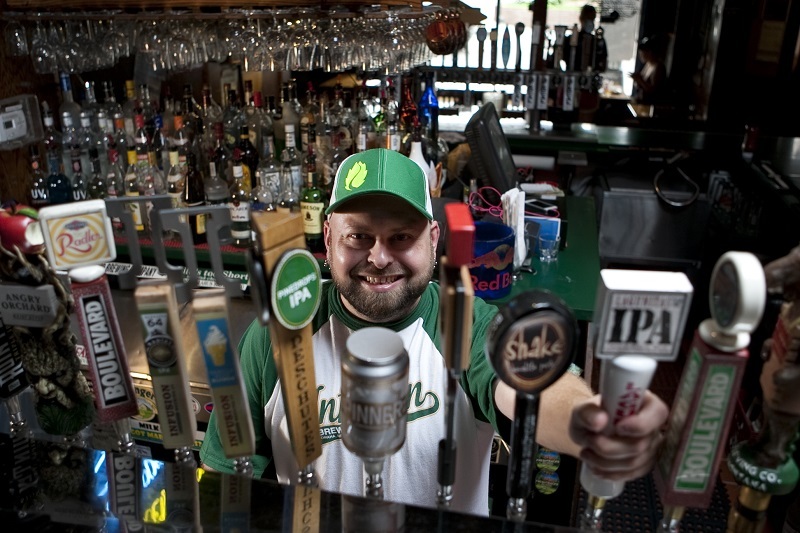 “A lot of my drinkers will look at the tap handles first and foremost, well before I’ve even handed them a paper menu,” says Chris Bettini, a bartender at the Crescent Moon Ale House in Omaha, Nebraska. Any time you enter a bar you’ve never been to, your attention is drawn to the row of tap handles like a fish to a shiny lure. It’s not only an anecdotal phenomenon. Anglia Ruskin University in Cambridge, England, conducted a study, tracking the eye movement of goggle-equipped pub-goers. Their eyes were drawn immediately to the pump clips before any other piece of marketing. When presented with unfamiliar brands, knowing nothing of the quality of the beer, 95 percent of participants picked a brightly colored pump clip attached to a guest tap, even over the pub’s own best-selling brand. By removing brand influence, the study was able to verify that drinkers will make an “appearance-only” decision when faced with a slew of unknown brews. Considering that humans will naturally gravitate toward something aesthetically pleasing, the tap handle or pump clip becomes an important tool for capturing new drinkers and selling more pints in an ever-competitive market. Not only an important tool, but sometimes the only tool a brewery has in a bar miles and miles away from where the beer was brewed. Tap handles can be made from nearly any material, but wood remains the oldest and most common option. Matt Warren of MJW Woodsmithing in Bend, Oregon, is one of many independent artists designing and making custom tap handles. After meeting with the brewers to come up with a design, Warren builds a prototype. From this blank he makes dozens of copies, each taking roughly three hours to lathe, sand and finish. Because he makes them by hand, he can splurge on details like acid-resistant finishes that hold up to the low pH of beer and last much longer than cheaper spray-on lacquers. Most are made from reclaimed wood—“reclaimed” here meaning scraps salvaged from high-school wood shops or old doors. For breweries seeking more cost-effective options (or with much wider distribution networks), custom handles made of urethane, wood, metal and other materials can be bought en masse, but the cost savings don’t kick in until certain quantities are made. Taphandles, the company responsible for some of the most common and recognizable designs in the market (like Angry Orchard’s menacing tree), sells handles for $20 to $30 each. A brewery can design a tap for free, but still has to pay a first-time order fee of anywhere from $500-$1,500. No matter a brewery’s choice, tap handles aren’t cheap. Breweries are paying a premium for direct marketing, investing in visual real estate to keep the cash, and beer, flowing. With clever or well-executed design comes risk; some popular or unique handles have been known to go missing, typically stolen by bold patrons who need but spin the screw of the handle loose and slip it into a bag. Those that aren’t stolen often aren’t returned to the distributors or breweries, either, leaving it up to the bar to decide their ultimate fate. As marketing plans change, taps change, relegating old or damaged handles to the trash can. Some bars keep an impromptu archive. Near the back of Max’s Taphouse in Baltimore, a hidden door descends into a colonial-era cellar packed with boxes. Dust coats classic versions of import handles—Bass, Boddingtons, Stella Artois, Heineken—right next to some of the first-edition handles from vanguards like Samuel Adams and Sierra Nevada. The graveyard proves a fascinating study in beerish history, but also reflects the substantial waste that comes from frequently changing handles. Regardless of the design, the tap handle (and the story it represents) is the only real chance a brewery has to do any marketing on premise. While a flashy design might catch a new drinker’s eyes, consistency between tap handles is integral to telling the story the brewery wants the drinker to hear. Consumers who have built an association with a certain brand and look can be confused if the brewery undergoes a massive redesign or seasonally changes taps. This is especially true in the smaller beer markets where most companies cannot afford television spots and rely on social media to spread any word of a change. Consistency leads to local ubiquity, which leads to consumer confidence, which leads to more beer sold. Unlike label art or other packaging that has space to build a narrative, a tap handle needs to be an at-a-glance connection, built specifically to be a bridging chapter in the middle of a story, not the introduction (and hopefully not the ending). Each tap handle helps growing and refining palates that may still need cues to recall who made that good beer they had last time. Sure, to the old guard of beer, a tap handle might seem like an overly designed piece of groupthink fluff, but to many, they remain a piece of the puzzle they’re trying to complete 16 ounces at a time. Editor’s Note: In an earlier version of this story, the company Taphandles was misspelled and some pricing information was misidentified. Breweries can submit designs to Taphandles for free rather than paying a $2,000 design fee. 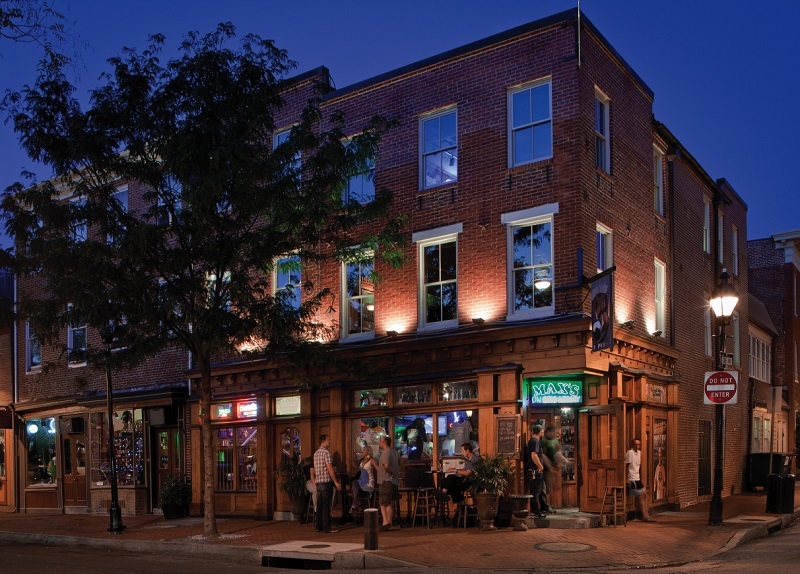 Oliver Gray is a Maryland-based writer, editor and homebrewer. On Twitter @OliverJGray. Nah, tap handles make no difference in what I order. Heck, go to Al’s of Hampden, which has 102 taps, you’ll see plain non descript handles..
Ah, but step into a chain restaurant, like Applebee’s, and the taps play a huge role. Jay, email me on your design your looking for. James, I make custom handles (Cnc mill & lathe) out of Aluminum in the Raleigh area. On the contrary, I think that that in America, it’s the old guard that is sticking with tap handles, rather than vice-versa. This may be anecdotal evidence, but I see more and more beer bars steering clear of those busy blizzards of branded beer handles, switching instead to uncluttered rows of uniform taps (with simple identifying adornments). Do tap handles sell me on a beer? Nah! I do peruse the row of tap handles to see what’s available, but primarily I’m looking to see what beers I’m familiar with or those I haven’t tried yet but want to. However, I do think its important that a brewery have a distinctive and recognizable tap handle so that I can quickly do the above mentioned visual scans. 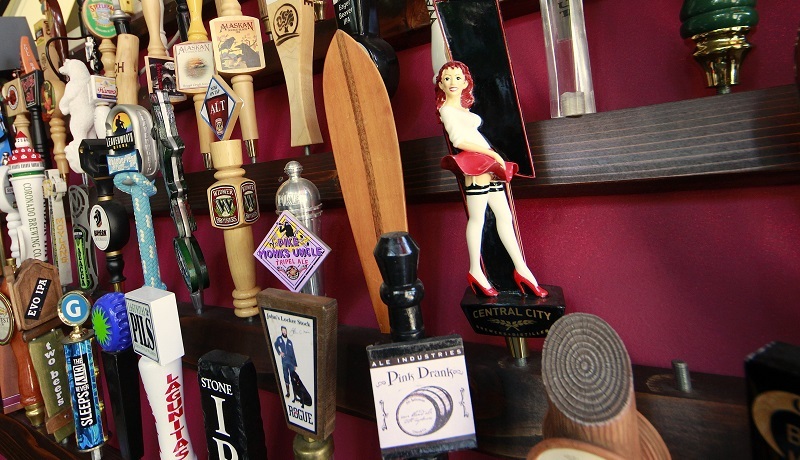 Tap handles can play a huge role if they are designed properly. A lot of times it is the only advertising you have outside of the brewery. So you have to get it right! How many times have you seen a handle turned sideways because the bartender is to tired of scraping his knuckles on the other taps, or worse accidentally opening another tap. Now how useful is that tap handle? There are so many things that go into a great design. At my company we try to get our customers to think about advertising and functionality first before we get to the artistic elements.